Hello! It's time for another Mojo Monday sketch (#289)! Today's sketch is brought to us by Julee. I flipped the sketch and made a 6x4 card for my Project Life album. I thought I did pretty well to stick to the sketch, but then the card felt a little out of balance, so I added the trio of banners to the lower left. :) The sentiment is from Blue Skies. Paper: cloud from Maggie Holmes (Crate Paper), pink polka from my stash, Classic Crest Solar White (Neenah), Vellum. Accessories: A Cut Above Dies: Flag It, Pennant Trim (Verve); Water seam binding, Umbrella wood chip (Freckled Fawn), Pearls (Kaisercraft), Foam tape, Thread, Sewing machine. Stephanie, love how you adapted the sketch on your gorgeous project. That umbrella is just adorable. What a great card. Love your stitching! So pretty Stephanie! 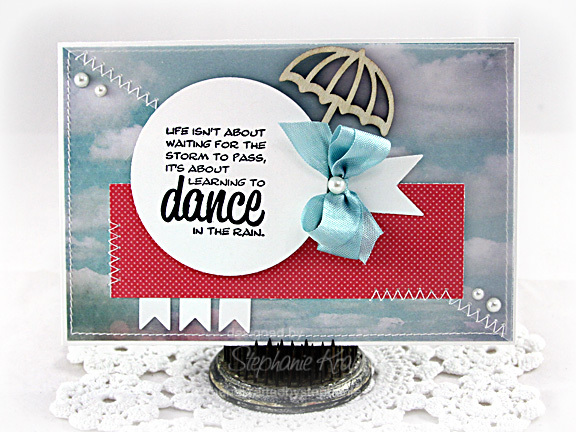 Love the wooden umbrella paired with the fun sentiment! This is just fabulous, Steph! LOVE that little umbrella! Love your flipped version...and the addition of the flags is a great detail!